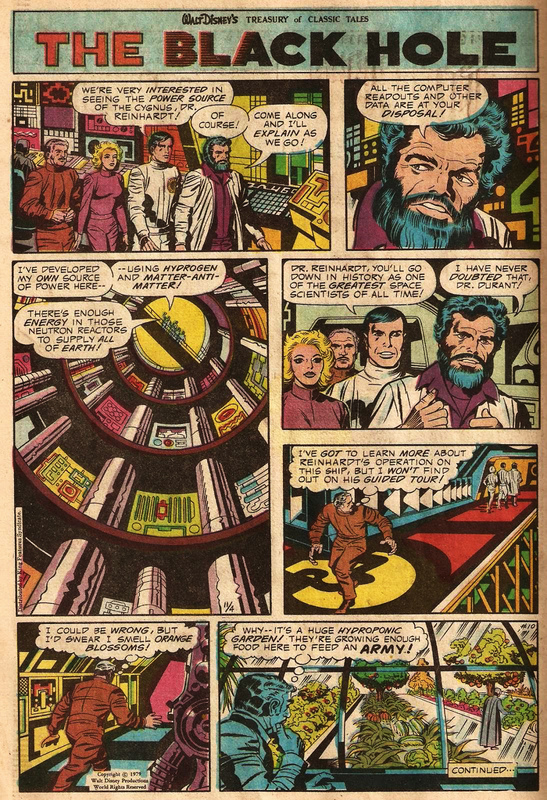 The Black Hole by Jack Kirby | 'TAIN'T THE MEAT… IT'S THE HUMANITY! 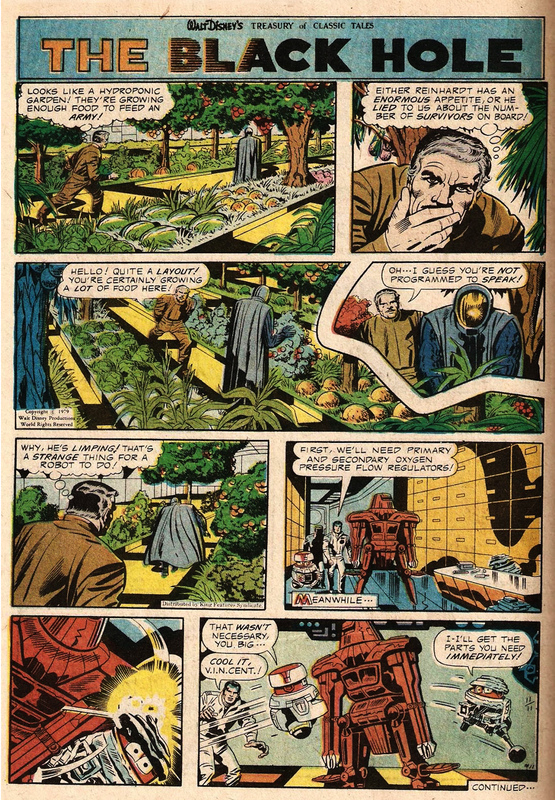 Walt Disney’s Treasury of Classic Tales was a weekly Sunday newspaper strip that ran from July 1952 until February 1987. 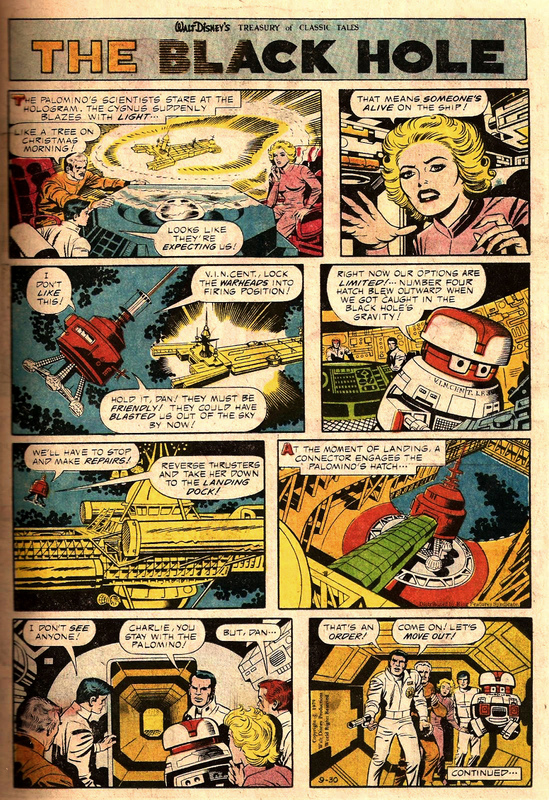 The syndicated strip featured adaptions of classic Disney films, usually spread over six months worth of instalments. 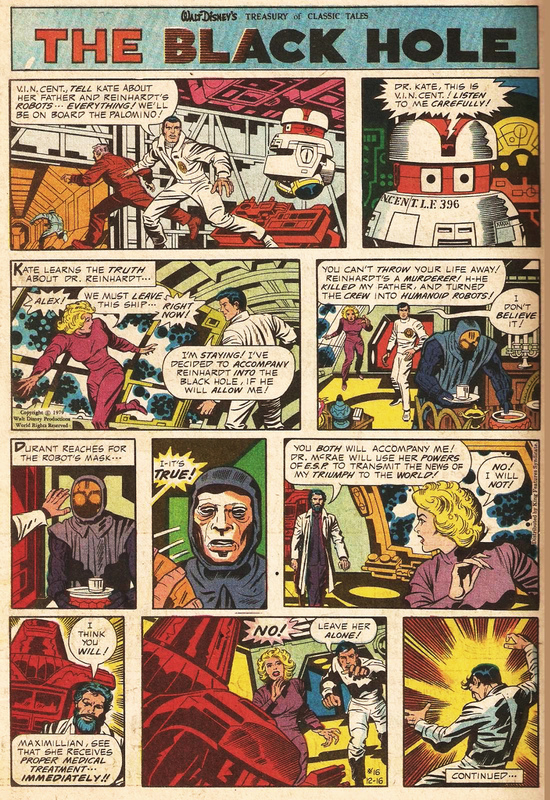 During its 35 year publication history Walt Disney’s Treasury of Classic Tales featured adaptions of dozens of Disney’s most famous movies, including Snow White and the Seven Dwarfs, The Lady and the Tramp, Sleeping Beauty and Pinocchio. 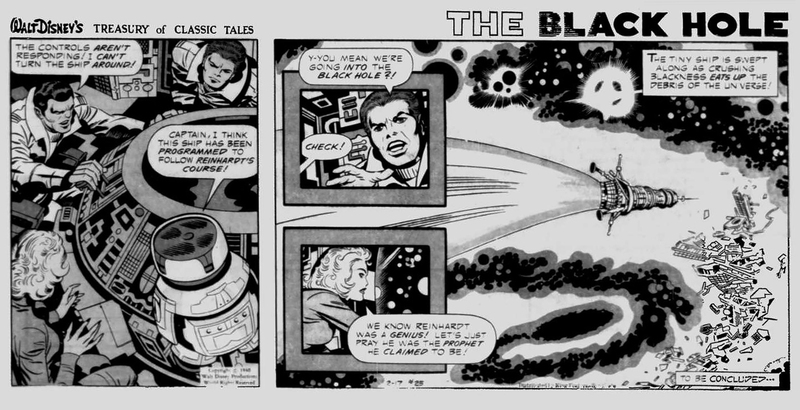 And between 2nd September 1979 and 24th February 1980 it was the turn of The Black Hole, Disney’s big budget answer to Star Wars (or so they thought). 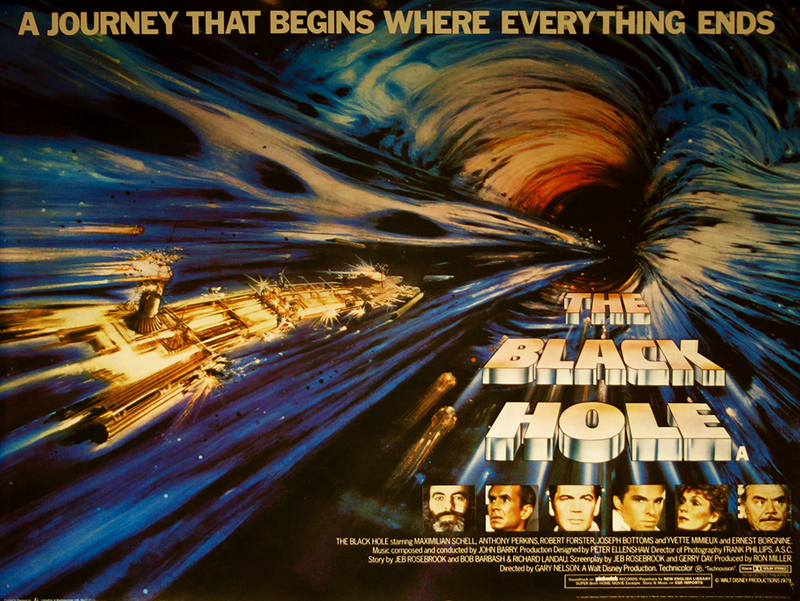 The Black Hole was released by Walt Disney Productions in December 1979 and was not only Disney’s most expensive movie to date, but the first to be given a PG rating. 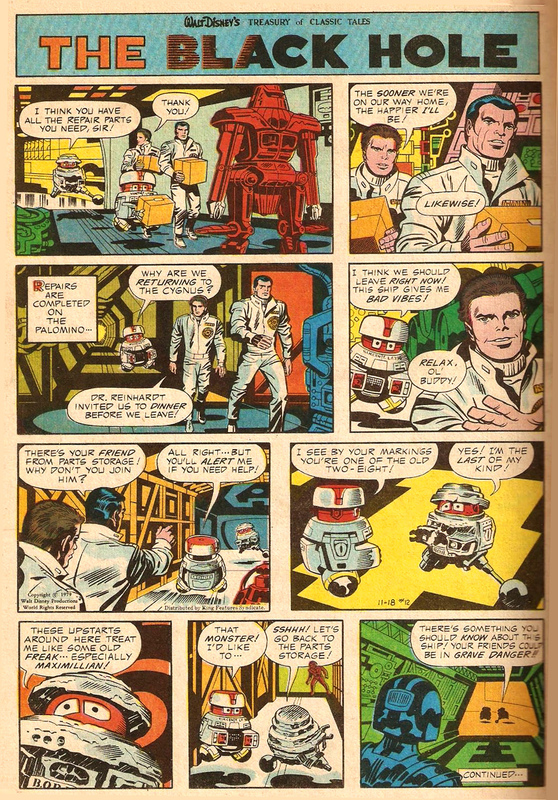 The film was directed by Gary Nelson (who also helmed the hit Freaky Friday for Disney in 1976) and featured an all-star cast (well, kinda) including Anthony Perkins, Ernest Borgnine, Maximilian Schell, Robert Forster and Roddy McDowell. 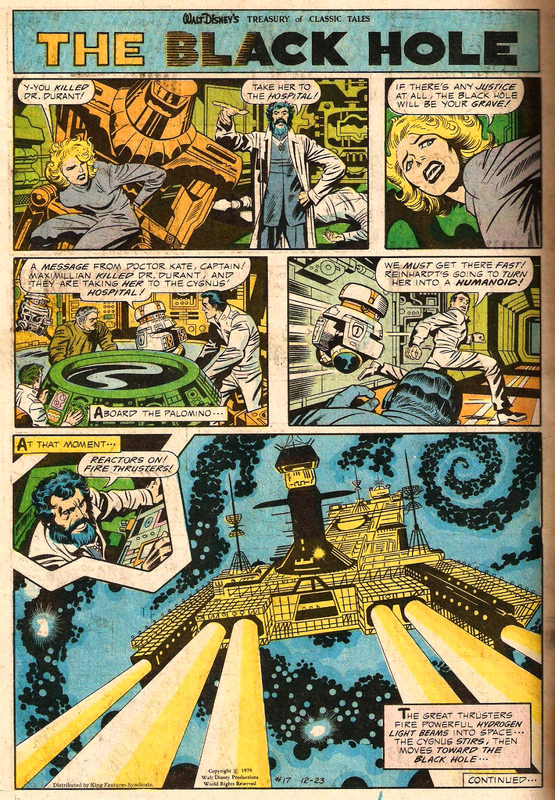 The film deals with the crew of the USS Palomino, a deep space exploration vessel which comes across the USS Cygnus, long believed to be have been lost, perched on the edge of a black hole. 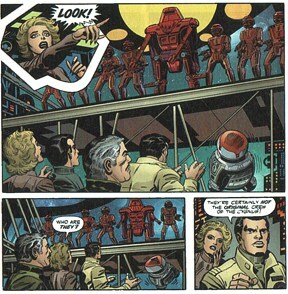 When the crew of the Palomino board the Cygnus they discover its seeming sole survivor Dr. Hans Reinhardt (played by Schell), aided by a crew of humanoid androids and a giant, sinister-looking robot called Maximilian. 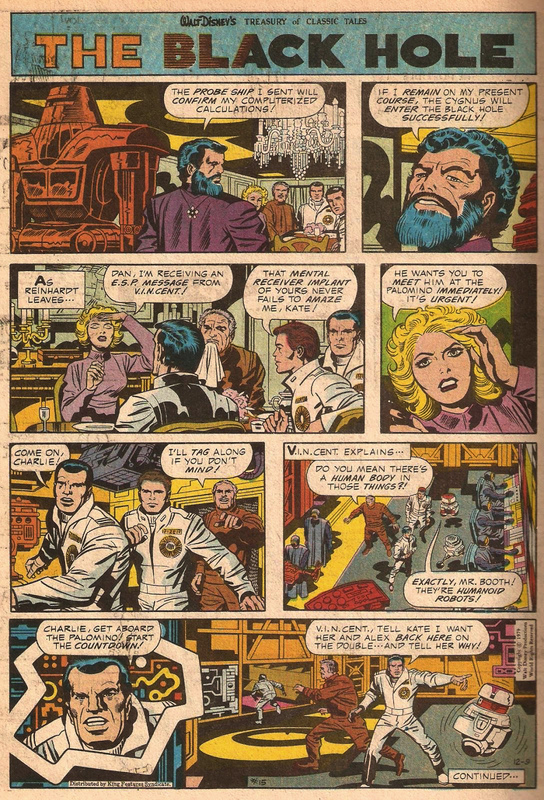 The crew of the Palomino quickly discover that all is not what it seems aboard the Cygnus and that Reinhardt harbors a dark secret that threatens them all. 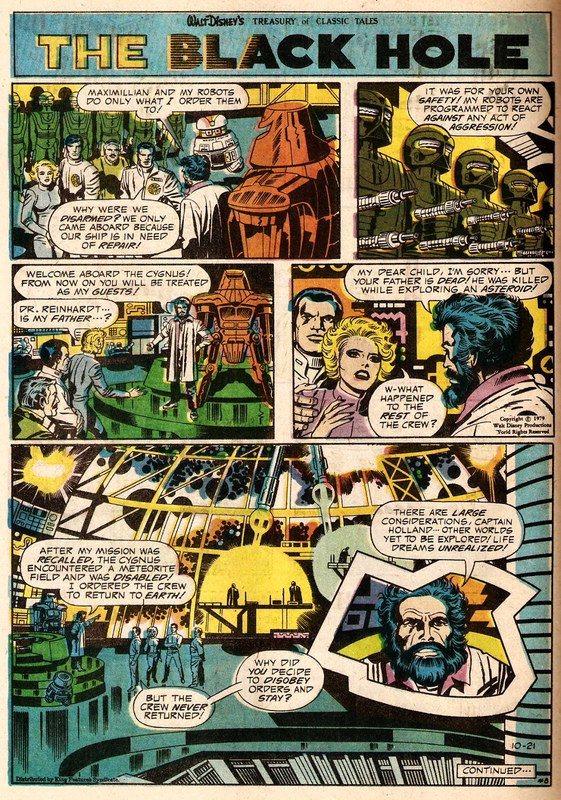 Although The Black Hole was a modest success when it was released, it didn’t prove the mega-hit Disney was hoping mainly because its just not that good a film (to date Disney hasn’t even bothered giving it a Blu ray release). 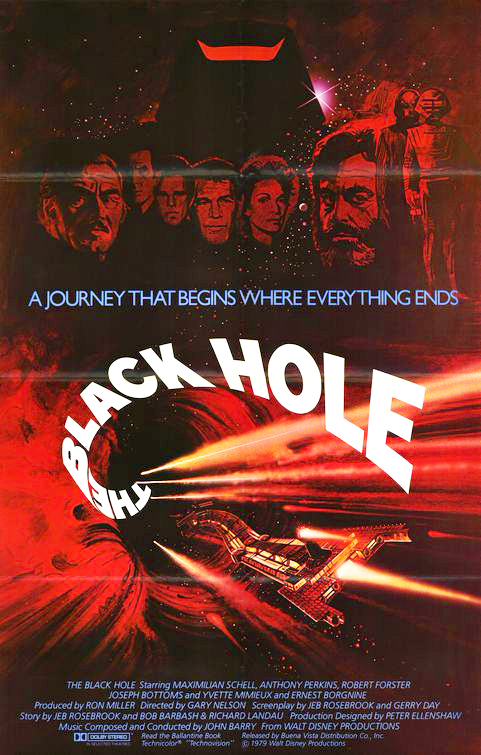 The UK poster for The Black Hole (NOT drawn by Kirby!). 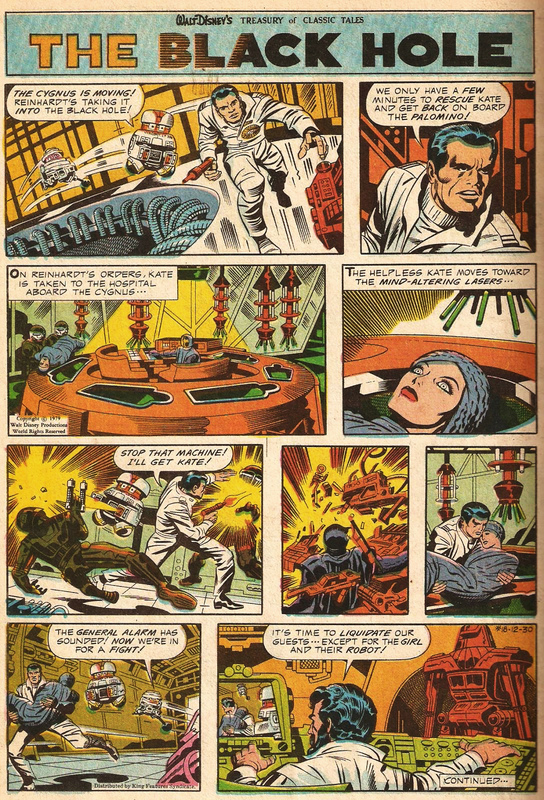 Published to coincide with the release of the film, this 26-part adaption of The Black Hole was syndicated through dozens of newspapers, and is most notable for having been drawn by comic book legend Jack Kirby. 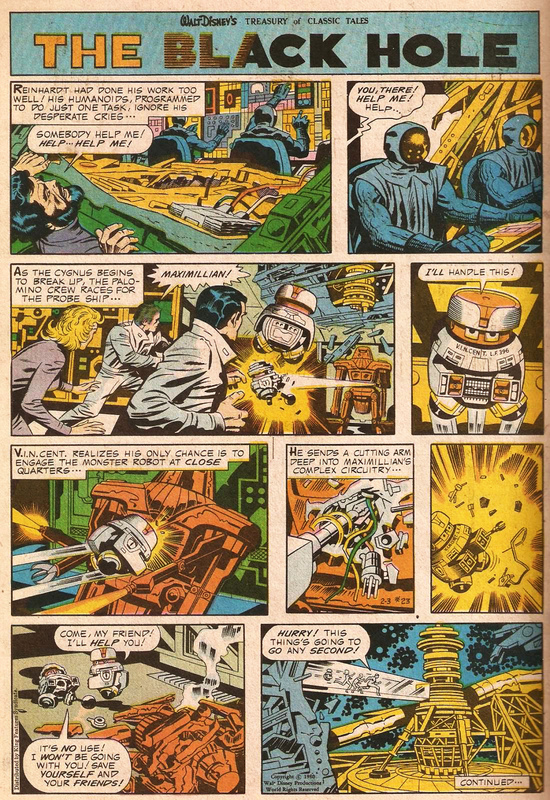 By the late 1970s a disillusioned Kirby had left the comic book industry and was making a living as a freelance artist, mainly working in TV animation. 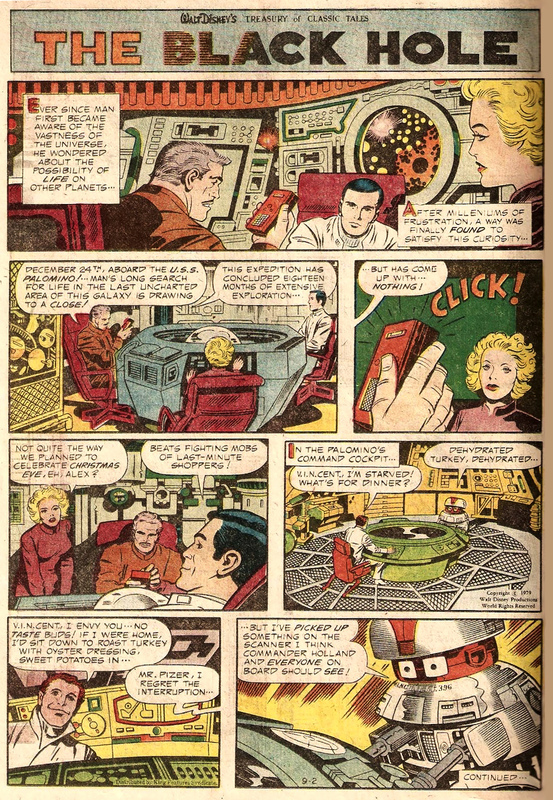 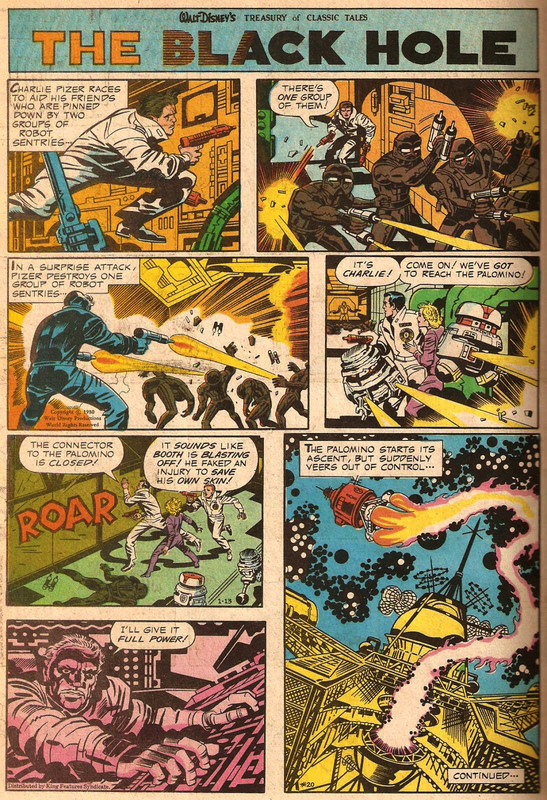 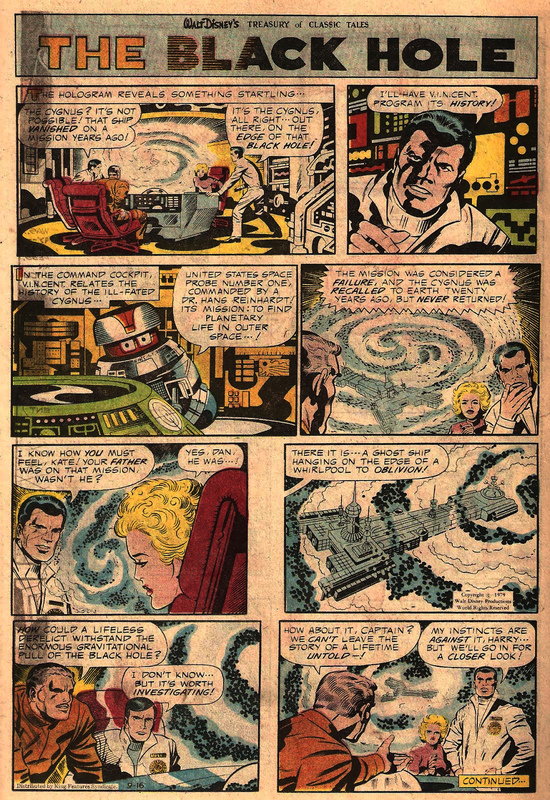 For his work adapting The Black Hole Kirby applied his usual visual panache to the strip, but the limitations of the single page format clearly restricted his trademark larger-than-life visuals. 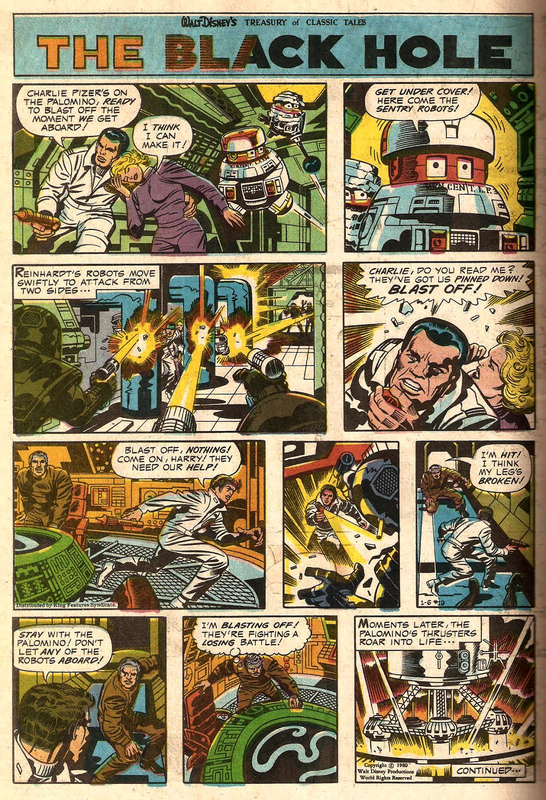 And remember, he was working for Disney, so he clearly had to rein-in his usual visual bombast. 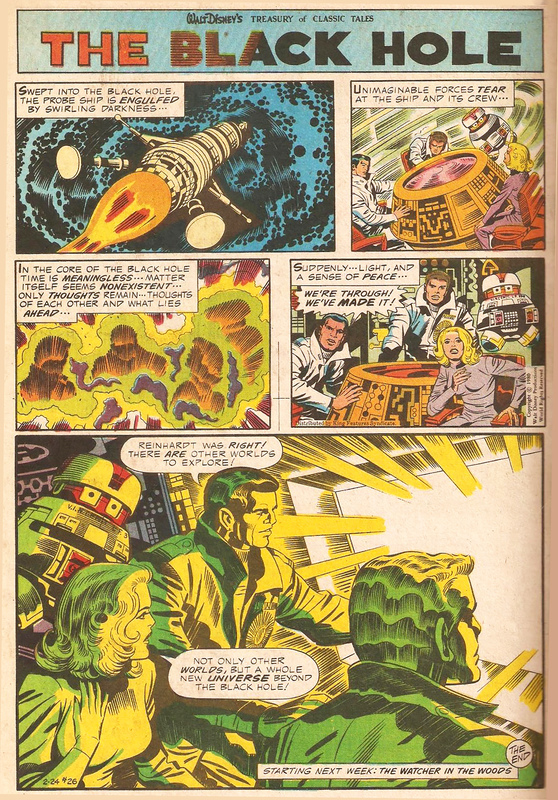 Still, despite those constraints Kirby did a good job on the artwork, which is both crisp and fluid. 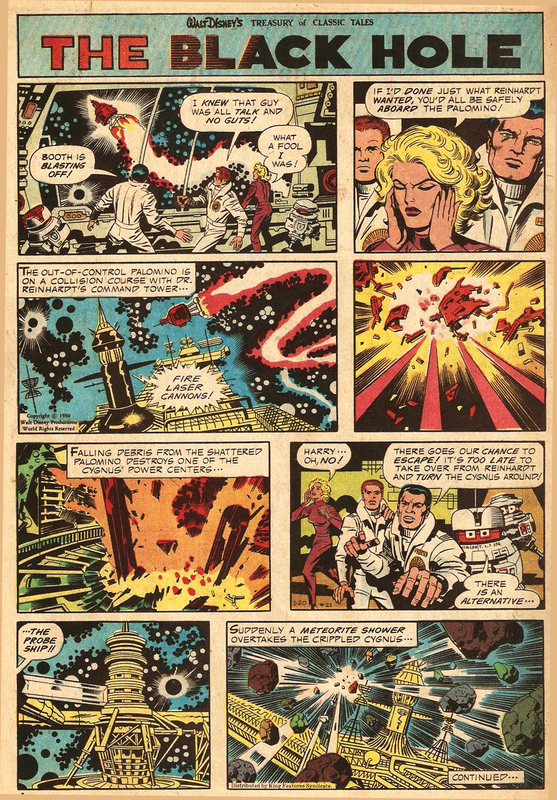 The story was written by Carl Fallberg, a Disney veteran who wrote dozens of adaptions for the syndicated strip. 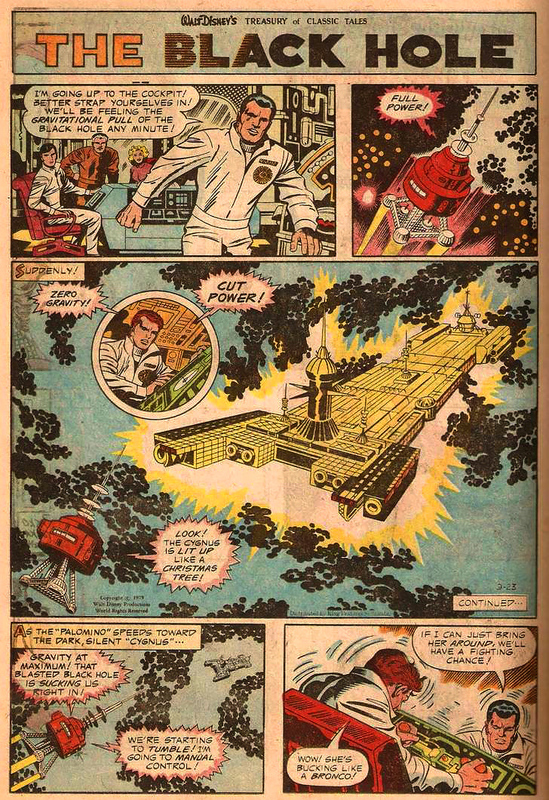 Fallberg did a decent job adapting the film, although it’ll come as little surprise that the film’s most memorable scene — Maximilian and Reinhardt, fused together presiding over a fiery hell-scape — was omitted. 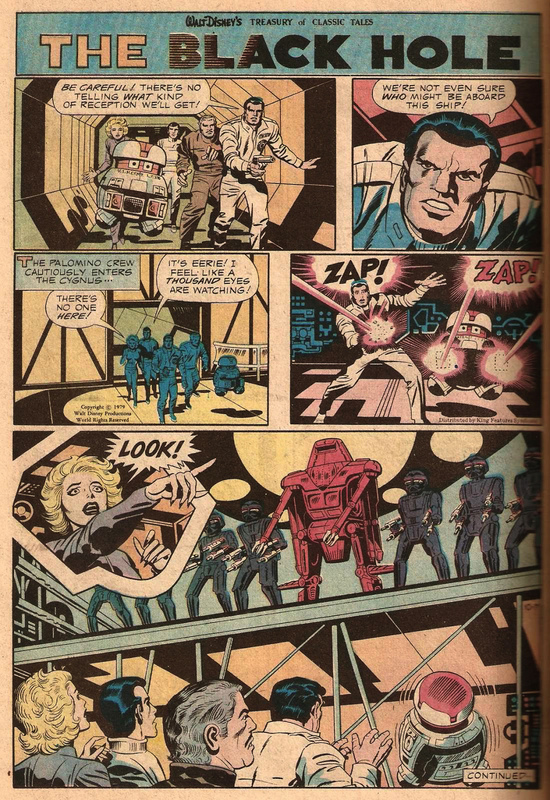 Finally, the strip was inked by Mike Royer, Kirby’s inker of choice in the 1970’s, who did his usual bang-up job. 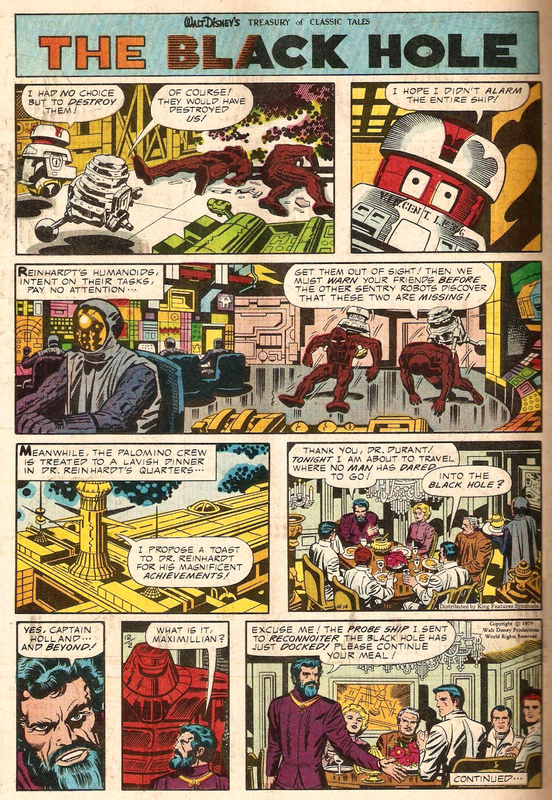 In 2007 the Disney digest ‘Comic Zone’ reprinted recoloured strips from the Kirby adaption. 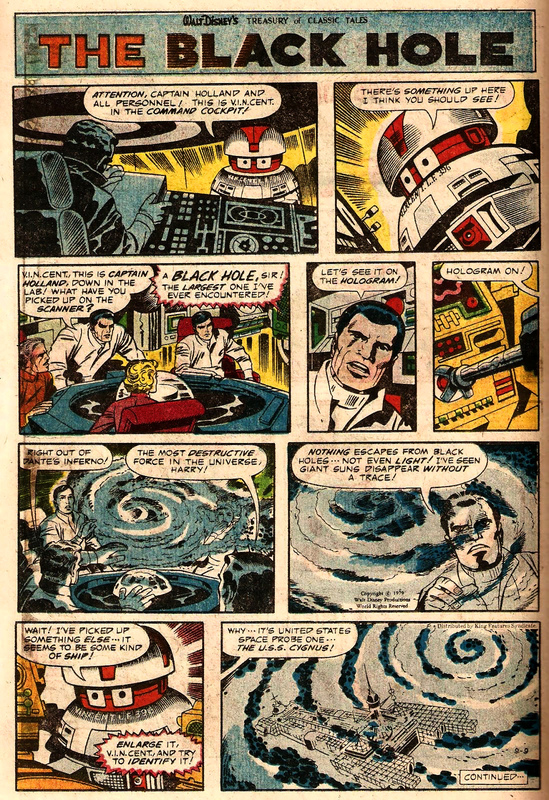 Walt Disney’s Treasury of Classic Tales adaption of The Black Hole was published in different formats: there was the standard full page, full colour version that appeared in many newspapers, as well as a smaller, black-and-white version that was reprinted at ½ page size or smaller. 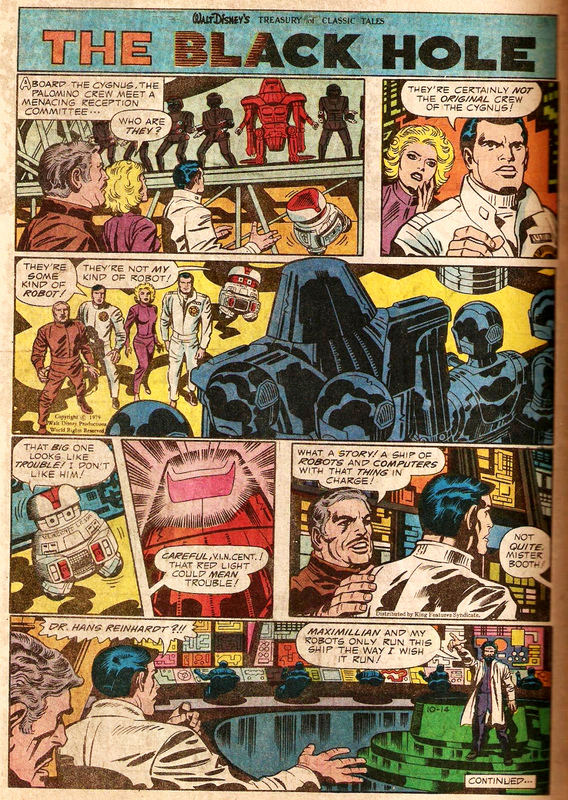 These smaller versions featured the same artwork as their full page counterparts, but with the panels rearranged to fit the squatter format. 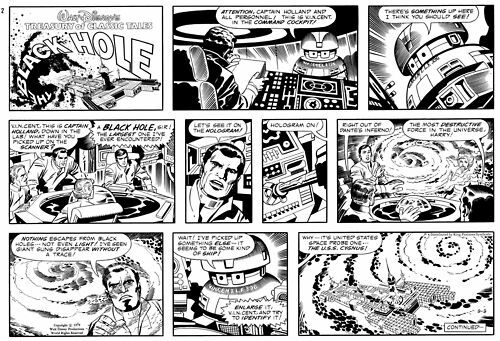 The squatter black and white version of the strip’s second instalment. 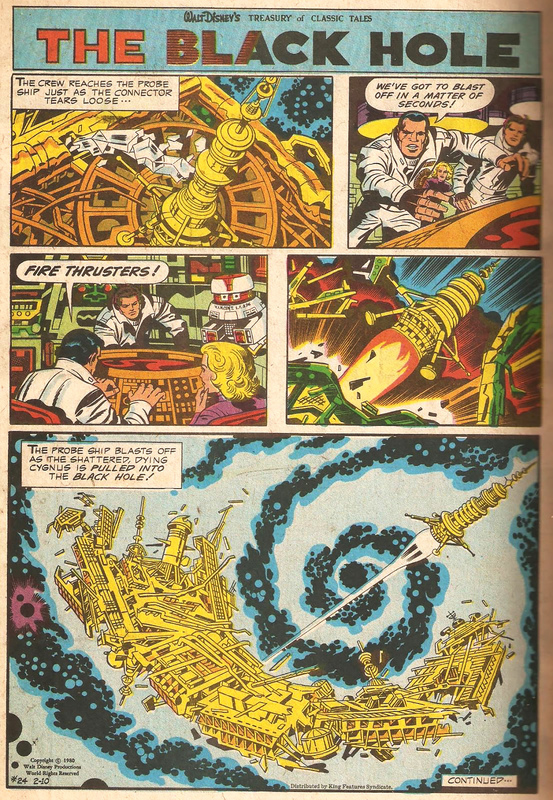 Below are all 26 instalments of The Black Hole. 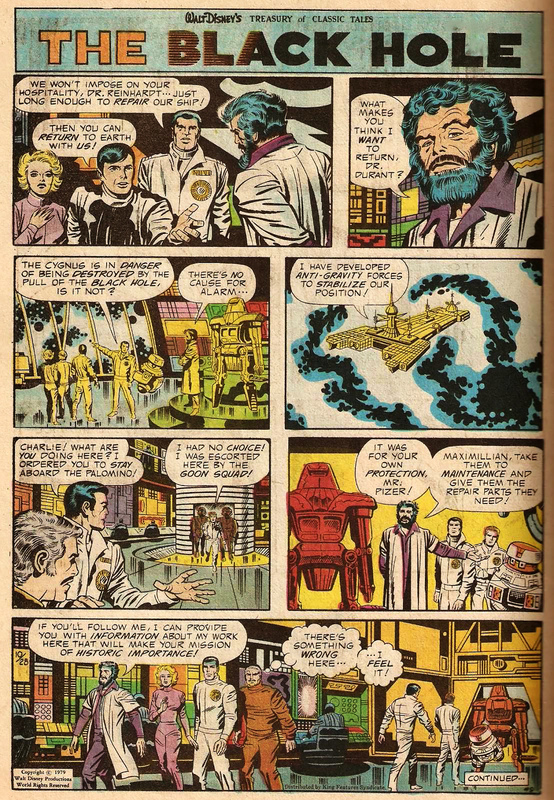 Unfortunately I haven’t been able to track down a full colour, full page version of the penultimate strip (published on 17th February 1980), so instead I’ve posted the half page black-and-white version of the page. 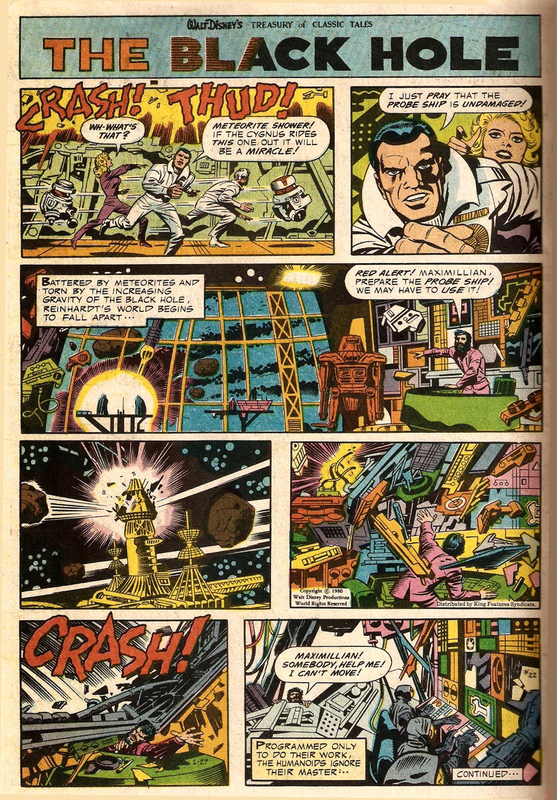 So enjoy this rare treat: a Disney blockbuster movie viewed through the lens of one of the true greats of comic book art. 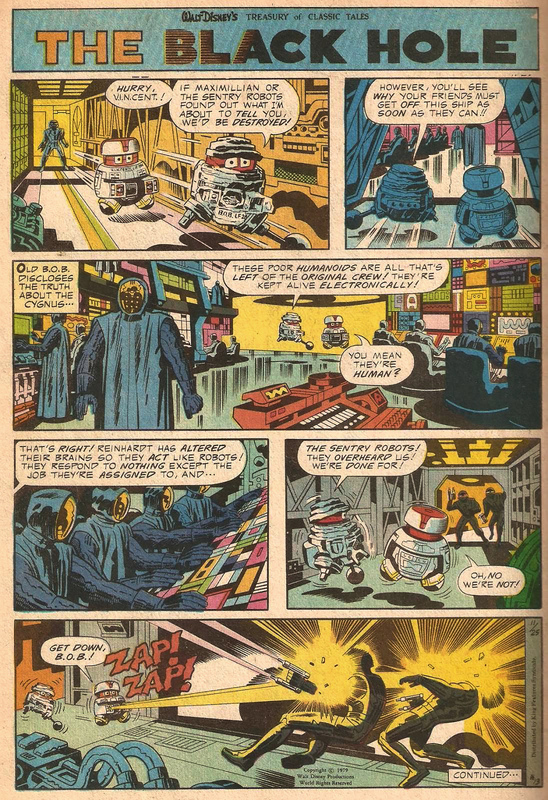 It’s certainly more entertaining than the film itself.